Growing up I was often told to stand up straight, shoulders back, stomach in, chest out. As I get older that seems to get increasingly difficult – especially the part about keeping the stomach in! 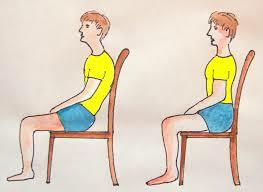 However, posture is not just important physically but in our relationship to God and others. In Psalm 1 the writer speaks about walking, standing, and sitting, while the apostle Paul in his letter to the Ephesian starts with sitting, then walking and ends with standing. What does our posture have to do with our relationship with God and the way we live in the world? Come Sunday and find out! This entry was posted in Sundays. Bookmark the permalink.